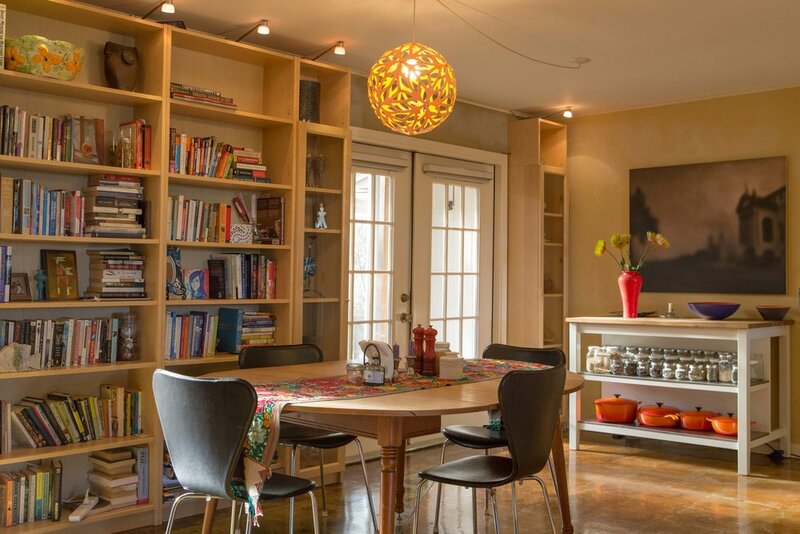 Fairly inconspicuous on the outside, this South Austin home that belongs to Roland Huettel and Esther Mizrachi is an ever-changing work of art in which installations are created as inspiration strikes. 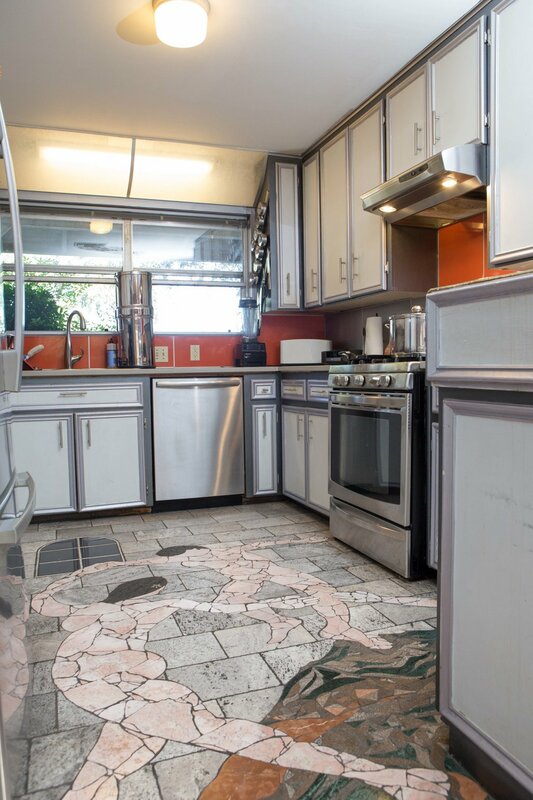 The art installations are not the only thing that make this house unique, it is also characterized by it’s noticeably tilted floor. Roland first purchased the house in 2003 after falling in love with the beautiful yard, which backs up to a creek. Although he didn’t end up building an entire compound, the inspiration of Japanese Architecture in his work is plain to see. The living room features a “Japanese Sitting Area,” his concession on the Sukiya style architecture. He had traditional mats imported from Japan and constructed a frame with plywood. He used a pecan tree that had died in his backyard and some metal to build the light fixture in the corner. Roland, born and raise in Germany, always had an affinity for the arts. “Art was the only thing I wanted to do,” he says, “I was just scared that I wouldn’t make money that way.” He knew that he wanted to get out of Germany and after high school he learned how to make custom-shoes by hand. From that experience he developed a deep passion for quality workmanship, which he knew would be appreciated in America, so he came here with a bag of tools, ready to make a new life for himself. On his first night in the house Roland slept on the floor in the workshop in the garage. His earliest project was to convert the 600 sq ft garage space into an apartment. He designed a bathroom and kitchen, installed them with a friend’s help, and lived in the garage apartment while renting out the rest of the house for the first few years he owned it. 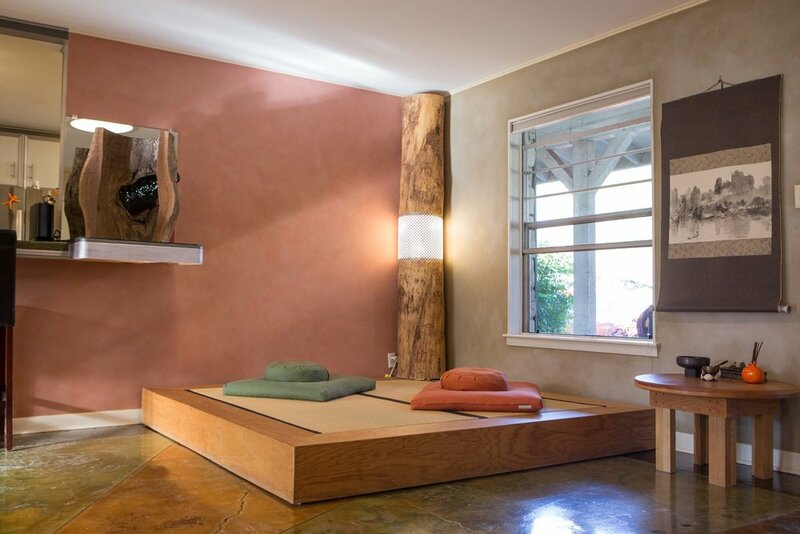 Later on, in 2010 when Esther moved in with her son Jesse, he further updated the garage apartment to include a moving wall; which gave the option to separate the “living room/guest bed area” from Jesse’s bedroom area. The men in Roland’s family were all inventive, creative, engineer types and he took joy in sharing that tradition with Jesse when they built the flexible wall together. It was a sweet bonding experience. 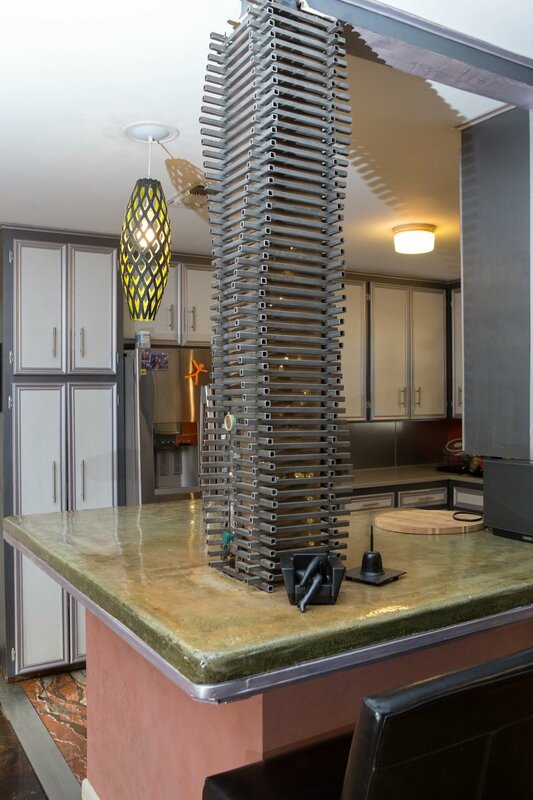 In 2008, after breaking down a wall that separated the kitchen from the living room and dining room and assembling one of his first installations; the stackable metal skeleton around the beam from the counter top, Roland began to work on his living room floor. Designed to be in the exact center of the house is his take on Michelangelo’s “The Creation of Adam” featured originally on the Sistine Chapel’s ceiling. He enjoys the somewhat sacrilegious irony of having this piece on the floor. The piece was made almost entirely out of samples from various tile stores. This was one of the earlier major art installations to take place in the house. More recently Esther and Roland collaborated to create a mosaic interpretation of Matisse’s “The Dance” on their kitchen floor. The master bathroom is Puebla inspired. It features a Talavera sink and shower designed by Roland. He felt it very important to have a shower that featured a lot of light and color so that when he got up in the morning to take a shower it would feel bright and exciting. The table Roland built on the porch was based on a design by artist Donald Judd that’s located in Marfa, TX. 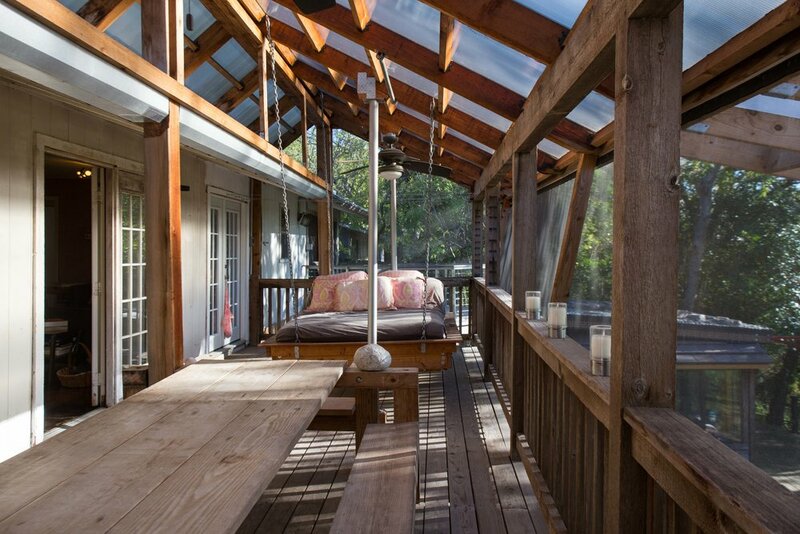 A bed on the beach that they enjoyed on a trip to Mexico inspired the idea for the swinging bed, which takes up the other half of the porch. Roland screened in the porch and added a roof a few years ago. A light installation is the most recent piece added to the living room. The galaxy inside of a tree trunk invites an intimate encounter. Roland was hiking after a storm and saw a dead tree laying on the ground. He went back to the woods with a handsaw and strapped a piece of the trunk to his back for a 3-mile hike out.